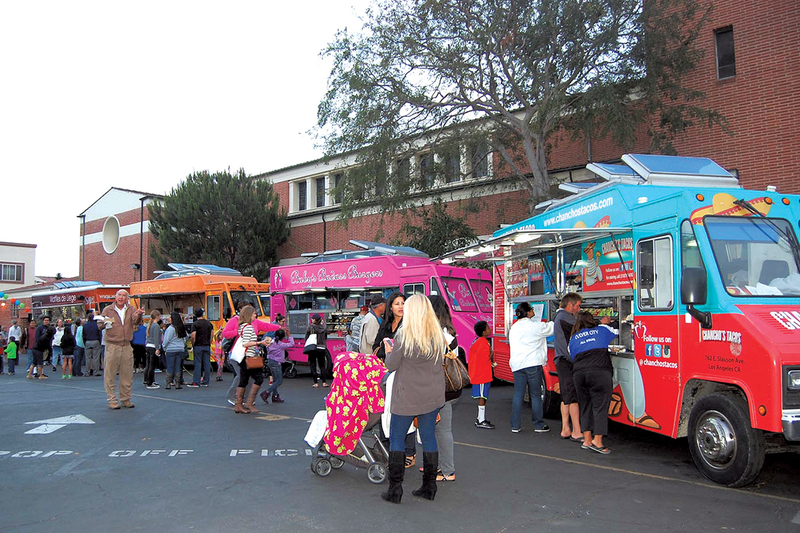 Visitation School and Parish’s Food Truck Friday Nights started off with the simple idea to create a community event that would feature some of L.A.’s most popular food trucks in an effort to draw people to its campus. Now in its fifth year, the event has morphed into more than just an opportunity to pick up a quick bite, however. With hundreds of people attending each Food Truck Friday Night, which runs monthly May through September, the event has turned into a summer staple with a block party feel celebrating good food, friends and community. At each event at least fourteen gourmet food trucks– serving a variety of cuisines from Italian, Mexican, Greek, Southern, French, American and Japanese–offer food for sale. Some of the most popular vendors include the Grilled Cheese Truck serving comfort food with a gourmet twist, Lobsta Truck specializing in New England inspired lobster rolls and Waffles de Liege offering up waffle sundaes with all the fixings. While each Food Truck Friday Night features live music, O’Malley’s Pub serving beer, wine and margaritas, an all homemade bake sale, hoop dancing and face painting, O’Connor says it’s important to continue to raise the bar each year and offer new activities and entertainment. An integral part of each event is celebrating the accomplishments of people in the neighborhood. In the past, Visitation has called up on stage little league champions, art contest winners, the military and outstanding sports teams to deliver recognition and complimentary treats. This year, organizers have decided to use each Food Truck Friday Night as an opportunity to celebrate the decades with “all community, all schools, all years” reunions. Each month will celebrate a different decade from the 50s to the present. It is this hometown feel that inspired the 2015 Food Truck Friday Nights decades reunion events. First up for Food Truck Friday Nights is a “Totally 80s” theme on Friday, May 22. At the event, Bishop Montgomery’s CIF Championship Boys Basketball team, including Visitation alumnus Blake Miles, will be recognized for their accomplishment. This year’s Food Truck Friday Night schedule is set for Friday, May 22 with an 80s theme; Friday, June 12 with a 70s theme; Friday, July 17 with a 60s theme; Friday, August 14 featuring a 90s and beyond theme and Friday, September 18 with a Rock ‘n Roll 50s theme. Each event runs 5 p.m. to 10 p.m. on the campus at Visitation School, located at 8740 S. Emerson Ave. in Westchester. To view a schedule of food trucks and for more information, please visit visitationchurch-la.com or visitationschool.org. Those interested in reserving class reunion tables may call Terry O’Connor at (310) 994-9904.